Mount Apo on the Philippine island of Mindanao, the country's highest peak. The Republic of the Philippines is one of the island countries located in the Southeast Asian region, and an archipelago nation consisting of around 7,641 islands. The islands are categorized under three geographical regions including Luzon, Mindanao, and Visaya. Philippines’s total land area, including the water bodies, is 300,000 square kilometers with a coastline which is 36,289 kilometers long. The mountainous regions of Philippines are covered in tropical rainforest and volcanic origin. The rainforest and the mountain regions are home to wildlife including birds, plants, and animals. The Philippines is home to over ten mountains exceeding 8,900 feet. The most notable of these mountains are looked at below. Mount Apo is the largest and the tallest solfataric mountain on the island of Mindanao and in all of the Philippines. The mountain has an elevation of 9,692 feet and is located between the city of Davao and the province of Davao del Sur. Mount Apo is characterized by a tropical rainy climate with rainfall relatively distributed throughout the year. 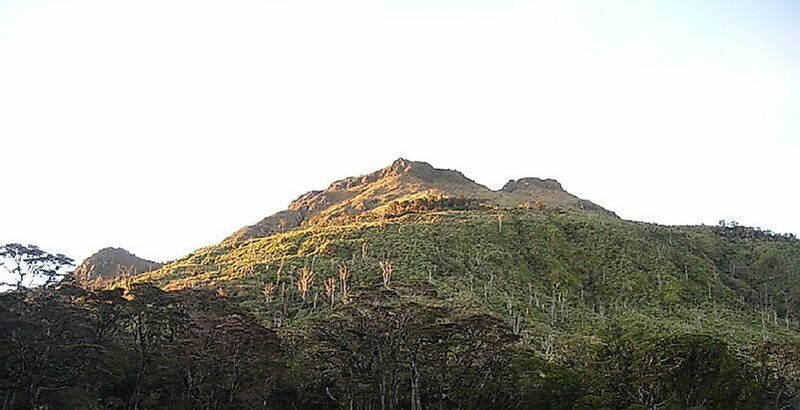 Mount Apo is home to over 272 species of birds of which 111 species are endemic to the mountain. 19 rivers drain Mount Apo’s eight major watersheds. Six indigenous groups of people including Bagobo, Ubos, and Tagacaol live around the regions of Mount Apo and consider the mountain a sacred place and also a place for worship rituals. The mountain has faced threats of logging, exploitation, intrusion, and agricultural activities which have led to some drastic changes. Mount Dulang-dulang, or D2, is one of the highest peaks in elevation which form the Kitanglad Mountain Range with a hieght of 9,639 feet. The mountain is located in the north central part of the province of Bukidnon, Mindanao Island. Mount Dulang-dulang is covered by forest and is home to diverse flora and fauna with 58 species of mammals living within it. The mountain is a major headwater catchment area for several river systems including Maagnao River. Mount Dulang-dulang is also considered a sacred place by Lantapan of the Talaandig tribe. Mount Pulag is Luzon’s highest peak and the third highest mountain in the Philippines with an elevation of 9,587 feet relative to sea level. The mountain is characterized by majestic clouds and the Milky Way galaxy view which are a major tourist attraction to the area. Mount Pulag was established as a national park through a Presidential Proclamation on February 20, 1987, to protect the natural features of the area including the vegetation and the diverse wildlife. The climate around the mountain is temperate with an average of 5,000 millimeters of rainfall annually. Mount Pulag host 528 species of plants, 33 species of birds, and several endangered mammal species. The mountain attracts climbers all year round with four major trails up the summit including Akiki, Ambangeg, and Tawangan. On April 7, 2009, a plane carrying presidential appointees crushed on this mountain killing everyone on board. The Kitanglad Mountain Range dominates portions of the northern central province of Bukidnon, and covers portions of eight of the municipalities and cities within the province. The range is characterized by rainforest which hosts diverse species of wildlife. Mount Kitanglad is the second highest peaks of the mountain range with an elevation of 9,511 feet. The mountain is a protected area under the Presidential Proclamation of October 24, 1996.